Hillary Clinton rallied the opposition Friday with a videotaped message urging "resistance plus persistence" that she delivered via President Donald Trump's favorite form of communication — Twitter. "The challenges we face as a party and a country are real," a smiling Clinton said. "So now more than ever, we need to stay engaged in the field and online, reaching out to new voters, young people and everyone who wants a better, stronger, fairer America." Addressing Democrats still rattled by Trump's unexpected victory in November, Clinton urged them to "move forward with courage, confidence and optimism." 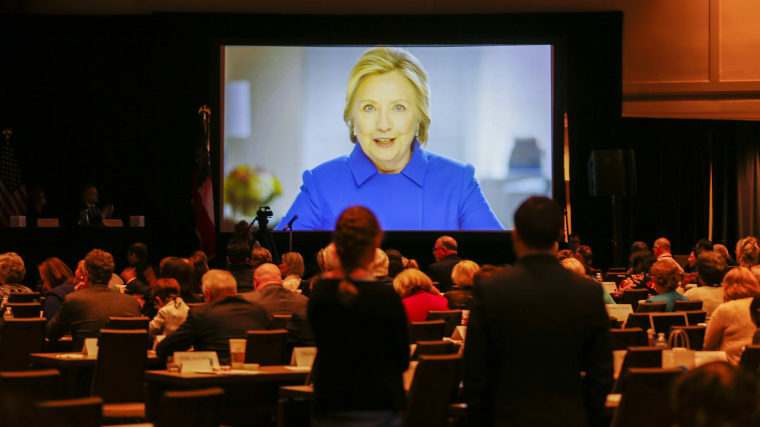 "And stay focused on the elections we must win this year and next," said Clinton, whose video was also shown at the Democratic National Committee meeting in Atlanta. "Let resistance plus persistence equal progress for our party and our country." It was a rare appearance from Clinton, who has kept a relatively low profile since her defeat and has said virtually nothing about the turbulence that has marked the start of the Trump administration or the anger that has exploded nationwide as the president puts his stamp on the country. "From the women’s march to airports where communities are welcoming immigrants, refugees and people of every faith, to town hall meetings where people are speaking up for health care, the environment, good jobs and all the other issues that deserve our passionate support," she said. While Clinton did not mention Trump by name, she got in a dig by saying that "nearly 66 million votes are fueling grassroots energy and activism." That's how many votes Clinton won in the election. And it is a sore spot for Trump who won the Electoral College but lost the popular vote by 3 million and has repeatedly made the bogus claim that millions of people voted illegally. There was no immediate response to Clinton's broadside from Trump.